Nokesville is a census-designated place (CDP) located in Prince William County, Virginia. Located in Northern Virginia, the area has historically been primarily focused on dairy production and cattle farming. It began to grow when a major railway company developed a stop in the area in 1865. However, in the 1950s passenger rail service was discontinued, which led to it becoming a much more rural, sparsely populated area. The area was important during the Civil War, with fighting near the Greenwich Presbyterian Church, and the Battle of Kettle Run being in the area. Today, many places in Nokesville, such as the Nokesville Truss Bridge are on the National Register of Historic Places; making it a relatively popular tourist destination for those interested in American history. The town is bordered by Bristow, as well as Catlett, Independent Hill, and Canova. Transportation is primarily by car. Virginia State Route 28 runs directly through the center of the town, providing easy access to surrounding communities, as well as Washington D.C., and other major cities that are north of Virginia. Today, there are around 1,354 people in Nokesville, based on the most recently-available 2010 census data, and a total of 488 households. The median income of a family in the year 2000 was $68,611. During that time, no families in the area were living under the poverty line. The town has minimal shopping, but ample opportunities for recreation. 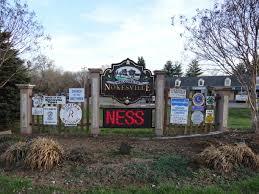 Nokesville Park has jogging trails, as well as baseball & soccer fields, a playground, and various picnic areas. There are also quite a few regular events hosted in the area, such as the Fall Festival at the Victory Baptist Church. A yearly parade, which celebrates the heritage of the town and is called “Nokesville Day” is also held every year on the third Saturday of May. As far as sports are concerned, the USA Rugby League has a presence in Nokesville. The Northern Virginia Eagles are based in the town. Football games at the local Brentsville District High School are also a popular pastime, with most games being very well-attended by locals. Homecoming games are particularly popular as a recreational activity. Schooling is provided by the Prince William County Public School system, but there are several schools located in the immediate area, such as Nokesville Elementary, Patriot High School, Kettle Run High School, and Greenville Elementary, as well as the T. Clay Wood Elementary School. This school district has been highly ranked in Virginia, and is the third-largest in the entire state. If you are curious to learn more about living in Nokesville, you can consult with the following resources, and learn more about the area, and what it has to offer.